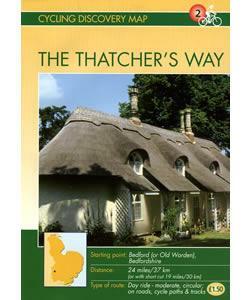 The Thatcher's Way at Bedford Cycle RouteThis cycle ride starts from either the peaceful setting of the Priory Country Park, or the landscaped grounds of the Shuttleworth Mansion. From here the route heads into an area of rich, rolling countryside. Alongside the wooded slopes of the Greensand Ridge, the ancient craft of thatching is kept alive in enchanting picture book villages, such as Swiss-style Old Warden and Ickwell with its maypole. Along this route you can discover a magnificent collection of flying machines, stroll amongst the tiny thatched buildings at the unique Swiss Garden, and enjoy a pint or two in our very own Ireland. Start Point: Bedford - Priory Country Park. Alternative: Old Warden - Shuttleworth College/Swiss Garden. Located 3 miles west of Biggleswade. Start Nat GR: TL073494. This cycle ride starts from either the peaceful setting of the Priory Country Park, or the landscaped grounds of the Shuttleworth Mansion. From here the route heads into an area of rich, rolling countryside. Alongside the wooded slopes of the Greensand Ridge, the ancient craft of thatching is kept alive in enchanting picture book villages, such as Swiss-style Old Warden and Ickwell with its maypole. Along this route you can discover a magnificent collection of flying machines, stroll amongst the tiny thatched buildings at the unique Swiss Garden, and enjoy a pint or two in our very own Ireland. How to get there by car/Parking: Priory Country Park. Located 1½m miles east of the town centre. Entrance off Barkers Lane, from the A428. Free parking.